Dukh me sumiran sab kare, Sukh me kare na koi; Jo sukh me sumiran kare, to dukh kahe ko hoi. Meaning: Everybody chant the names of the Lord in times of misery. None do so when they are happy. But if one remembers the Lord during the happy moments, then why will misery ever befall him.> So said Sant Kabirdas some 700 years ago. Yugas pass, centuries pass.. but eternal truths remain unchanged. So it is, with this poem from Sant Kabirdas.. it’s central idea comes back through this MMS with a difference.. Gurudeva has tailored this for the twitter generation.. direct, sharp and concise. In her immense love for her children, a mother cooks whatever they like, in whatever form they like.. she just wants the kids enjoy their food and eat well. Her only purpose is their well being. She does not impose her likes and dislikes on her children. Similarly, our Divine Mother – His Holiness – says “Chant the Bhavagad Gita, Vishnu Sahasranama, Lalitha Sahasramana and such… “ When He says “and such…” He gives us the liberty to choose names such as those of Lord Vishnu or the Divine Mother. He does not tie us down to a particular deity. We only have to keep chanting the divine names of our beloved Gods.. always – such is His love for us. The accompanying bhajan in the voice of His Holiness reiterates : “Datta Naam ke karthe sumiran, Datta Kripa hum paayenge, Datta dev ke karthe poojan, nit din samay bithaayenge” Meaning : . The video and audio elements integrate to make this MMS a sublime experience. Here too, His Holiness has shown us the way by ‘walking the talk’. He has recited all of these and more namavalis / ashtothrams / sahasranamams.. made them into CDs and offered them through flipkart .com. This is His way of delivering divinity into our hand phones. Such is His love for us. Such is His concern for our well being. We His loving kids.. only have to repeat what He does.. keep chanting the divine names of our favorite Lord. We will, your Holiness. We will. With namaskarams at your divine feet. Srimatparabrahma Gurum vadami Srimatparabrahma Gurum namami !! JGD Would do so. The happiness is great. Jaya Guru Datta, Swamiji,These sacred prayers are the storehouses of all sacred knowledge and are like like powerful initiations into the truth. And who could be more blessed than us to have the opportunity to hear them chanted in Your voice which is not only a sacred healing instrument but divine…Why do we hesitate when we have such a holy treasure as your CDs! Jaya Guru Datta for reminder! You have made it so simple for us….deepest gratitude and pranams! I chanted very rgularly Bhagavad Gita, then I learnt chanting the Guru Gita. I love it! I have the feeling, that it is good for me. I know that it brings a very good contact with my guru and I learn to understand more and more, what a Guru is, in what for a relation I am with Swamiji. But I know also, that I don’t know realy, how to be when I am near of my Guru. There are so much rules, which are strange for me. For this I am very very happy, that our Swamiji is accepting me also when I am not able to be always correct. Thank you! JGDH Puttuji! Very tender message showing us simple way to be in a very positive state of mind! Appaji in most of His Krishna Aastami messages urge us to read atleast one Sloka from Bhagavad Gita and further says that Gita teaches various methods of approaching God Head – Bhakti Yoga, Jnana Yoga and Karma Yoga. Appaji has rendered these Sahasaranamas’ so lucidly , that we can learn faster! Jai Guru Datta Appaji and Jayaho Puttuji – We will spend time contemplating on the Divine Names of the Lord to experience Constant Remembrance (Dharana/Dhyana) leading to the deeper meditative state, where we are completely absorbed in the Bliss, totally oblivious of the Gross (Sthoola-Physical) & Subtle (Sookshma-Mental) states… and praying to see your TRUE Energy/Light form (Nirguna Rupa). Please bless us with the discipline to make this a constant part of ourSELF. Thanks Puttuji for giving us many different ways to chant divine names of god. These prayers have immense benefit, they take you closer to god very quickly. They give us protection and alleviate difficulties. The deities become pleased and if you chant with love and humility, even if you make mistakes, still you will be blessed. If you are sincere the deity may even visit you in a vision or a dream! Truly these are great tools given to us , we must be wise and use them. Spoken from personal experience by a common devotee who has made many mistakes in life. As Sadgurudeva has asked us to this, then certainly he will help us to do it. Jai Guru Datta. Om namo Hanumate namaha. Time and tide waits for none, if we dont pull up our socks and follow the master, we may end up nowhere. For people who have experienced the life-transforming power of Vishu, Lalitha Sahasranamams, Kavacha Manjari, Guru Gita, Hanuman Chalisa,this message is a simple re-iteration. For the ones who are still contemplating to start, my humble suggestion is “please do not procastinate any more”. The CDs are all in HIS divine voice and the tune is so catchy and mellifluous, the lyrics books will make you want to sing-along and within no time, you will find for yourself that you have by-hearted them all!! Not everyone on this earth are lucky to have HIM as a guiding star and a guardian angel. We are lucky and we have HIM as a living example, who practices what He preaches, who walks the talk. If, He is saying it, we better do it!! Thanks Appaji, makes me feel good, because I chant them as much as I can. Now, I have to do it daily. Once I have accomplished that, I know I have that invisible shield protecting me, always and forever. JGD!! Jgd.There are many Guru’s that take over the possesions of the Disciple,But there are few Guru’s who remove the Hunger for knowledge and enlightenment.Sri Swamiji is one of the such few Guru’s who gives many variants for devotion.In this MMS Appaji holding the instruments of Bhajan and tells us to follow any one of the way of Devotion. jayagurudatta appajee…………………… i like devi bhagavatgeeta and sri krishna bhagavatgeeta. after listening these two geetas every one definitely can change. i had these two cds. I like Kleem & Aiam bheejakshara mantra in devibhagavatam. Beautiful bhajan background and very encouraging message to chant Sahasranamas. Nandana Gita makes us realise the love,affection and care Appaji shows for us. Appaji I promise, will not waste time, chant and happily listen whatever Sadgurudeva has blessed and given !! For easy access will get everything in hand phone, as Pujya Puttuji said. my experience comes from chanting Shatasloki Ramayana. i like it very much. i chant it along with Sri Swamiji’s video. It is as Sri Swamiji takes my hand in His hand and guides me into a new world. It is like an explanation about everything. Every day i learn something new. i learn also very much about the world i live in. it gives a deeper understanding. Koti koti pranams to the Holy Padas of Sri Guru Dattatreya. This MMS is an other help to clean our mind and have positive thoughts, itis also a way to be linked with the Divine. Om Rama , Rama. VERY GOOD VIDEO. CHANTING GOD’S NAMES GIVES ME PEACEFUL MIND AND ENERGY. Sri Swamiji said for Datta krupa we need to do Namasahashranama,Nithya Namajapa,Dhanam,Bhajan and Meditation are very important.Thank you Sri Swamiji. Jaya Guru Hanuman, Thank you Puttugamji for the amazing explanation. My dull mind is unable to comprehend the depth in each of the MMS’es until it reads your wonderful explanation. You are converting the sugarcane (MMS) into juice (explanations) and making us drink the sweet nectar. We will definetly try to do namasankeeratana as much as possible when we are happy. Humble prostrations to the lotus feet of Sri Swamiji whose life is the essence of all scriptures. Beautiful MMS video starting with Markata Dattatreya. Pujya Guru Deva has given many slokas for us to chant along with Sri Swamijis voice. Thank you Appaji for these assets. We will learn and sing the divine names always. Chanting Bhagavat gita, Vishnu sahasranama or Lalitha sahasranama helps us to be in association with God. Reading holy Bible and going to Church every Sunday to pray, are various ways to reach God. Our Sadguru Sri Swamiji always encourages all of us to follow their respective discipline to reach God. Wonderful message by Sri Swamiji to be followed by everyone and inculcate as habit by younger generations to maintain the tradition and culture. musical message. Sri Guru Datta! తండ్రి మా చేత నిత్యం దివ్య నామ సంకీర్తనలు చేయిస్తూ, సహస్రనామ స్తోత్రములును పటింప చేయిస్తూ,సత్గ్రంధములను పారాయణ చేయిస్తూ, మమ్మల్ని భక్తి, జ్ఞానముల మార్గము వైపు నడవండి అంటూ గీతోపదేశం చేస్తున్న మీ సందేశాలను నిత్యం స్మరించుకుంటూ, వాటిని అనుసరిస్తూ, ధ్యానిస్తూ నిత్య సచ్చిదానందమును పొందే భాగ్యాన్ని మాకు ప్రసాదించమని వేడుకొంటు, శ్రీ గురుదేవుల దివ్య చరనారవిందములకు శతకోటి ప్రణామములు..
New generations are moving away from all these as they seem to be for older generations. Our eyes have been opened through KSHT and the oppurtunities Appaji has given us. And, we are benefiting everyday. Unknowingly, of the MMS today, I was playing Sri lalitha saharanama today. Our kids have limitless oppurtunity to explore and learn. We never had access to any stotras or namavali growing up. Jai Guru Datta, Sri Gurubyo Namaha. Swamiji it’s our privilege to have such a great god as a guru. By listening Bagavad Gita and Ramayana, Lalitha and Vishnu Sahastra Namas our body and soul get relaxed, sometimes it acts as a medicine. It’s my personnel experience. I assure my children also will be habituated to listen such a wonderful music. Chaniting, chanting, chanting…Lalita Sahasranama, Gita, Shatashloki Ramajana, Hanuman chalisa and so one. So many things Sri Swamiji has given us for today and for the future. As Puttuji said Sri Swamiji gives us the liberty to choose names, as such as Lord Vishnu or Divine Mother. As an European I grow up with the Gospel of Lord Jesus. When I sing Gospelsongs alone or with my group then I know this are prayers for the Divine. Sometimes I have tears in my eyes and my heart is full of love when I feel this Divine power. Through the teachings of my Sadguru about Nada Yoga I learned not to be shy to express my feelings when I sing. Thank you Appaji for your guidance. aya Guru Datta – “Kalau Keertaya Keshavam” – what is keertana? chanting the names of Lord God is nothing but keertana. Sri Swamiji has compassionately given all the devotees so many bhajans with divine names. The ecstatic singing of these divine names will take us to the other world (when we experience it) and will help us lead our lives in a better way. This results in the righteous accomplishment of all the purushaarthaas – righteousness, wealth (nothing but gnana), fulfilling the desire of desire-less-ness and moksha. Not just the mukti aspect, but for us to be at peace with ourselves and to realize the purpose of life too is divine name helpful. Lets all join to keep chanting the names always and of the deity of our wish. one way or the other, Appaji wants all of us to be engaged in righteous conduct always and the guiding navigator is the singing of divine names. Thank You Appaji for all the blissful messages. It is true, when we start our day with chanting of a Mantra/Sahasranama we feel that we are more energized, happy and peaceful. So my Lord Sadgurudeva, please give me enough strength and will to continue this forever. Prostrations to the lotus feet of our SADGURU. Jaya Guru Datta Appaji. Thanks a lot for the wonderful MMS. This is a great video – music and visuals are in perfect synch. The bhajan and the message are also going hand in hand. It is our great fortune that Appaji has given almost all the divine names and chanting directions, no – the chant along experiences using the latest media like the CD/iPod et al. It is often said that salvation in this age is only through chanting divine names – ‘ಕಲೌ ಸಂಕೀರ್ತನಾನ್ಮುಕ್ತಿ’. This chanting is sankeertana is made very simple and handy for all the devotees as Appaji has given us so much in terms of keertana. Thank You Appaji for the wonderful MMS. Thank you Appaji for the everyday MMS. Please bless us to continu these chantings forever. JGD, I saw this message and listened to Shatashloki Ramayana yesterday., I was a little disturbed earlier yesterday evening but after listening SSR I was relaxed and felt peaceful. Thank you Appaji for your blessings. Some of us may never know how to pray according to the scriptures, but our love and devotion to our beloved Sadguru will earn us merit. Thank God for Lord Dattatreya’s incarnation in the divine form of Sri Swamiji for leading us along the right path. Pranams to the Lotus feet of Pujya Sri Swamiji. We’ll continue listening to all of the precious gifts that you’ve bestowed on us. Pranaams to our beloved sadgurudeva.we will defnitely follow your words.thank you appaji.after listening guru geetha , I felt how much i missed it before. jaya guru datta. The Adi Guru, Lord Datta has been assuming a physical form through the ages to help us navigate the ocean of samsara. The incarnations of Lord Datta beautifully adapt to the changing times to inculcate in us the timeless principles Jnana, Bhakti, Yoga, Karma and much more. In this yuga, Adi Guru Dattatreya, our Pujay Sathguru is showing the way again in a way that fits the pace of life today. We don’t need to live in a Gurukul and master the Vedas. We don’t need to walk out of our homes and do penance in the forest. We just need to sing the bhajans and recite the prayers Sri Swamiji prescribes. We just need to chant the “Om Namo Hanumate Namaha” or “Om Aim Hreem Sree Siva Rama Anagha Dattaya Namaha” whatever Sri Swamiji prescribes to uplift ourselves spiritually. We just need to do at least 10 minutes of pranayama to discipline our mind. No rigorous requirements! Perhaps the word “compassion” is humbled after seeing Swamiji! Obeisances at the Holy Lotus Feet! JAYA GURU DATTA! Happy and thankful for all Your mantras, Your CD`s, Your books, Your daily MMS and all other many help, unique wonderful Sadgurudeva! My pranams to Your holy lotusfeet. S.G.D.! JGD!!! Datta Kripa, Puttuji you have given us EVERYTHING… please continue to guide us towards that path… SGD!!! Jaya Guru Datta Appaji !!!! OM NAMO NARAYANAAYA OM NAMAH SHIVAAYA !!!!! OM NAMO HANUMATE NAMAH !!!! Sree Guru Datta !!! Namaste Puttuji. Thank You for a nice video. Sri Swamiji’s sayings, short stories, even His jokes also explain the essence of truths hidden in Bhagavad Gita, Vishnu Sahasra Nama, Sri Lalita Sahasra Nama and others in a simple and understandable way to the people in the present luxurious and less morally intended world. There are many ways explained to control mind, to reduce stress etc, which are very much necessary in the present fast paced world to achieve one’s goal. Namaste Puttuji. Die Namen Gottes zu singen ist eine der vielen Möglichkeiten, die uns unser APPAJI anbietet, um unseren spirituellen Weg gehen zu können. Die Vibration der eigenen Stimme im Körper lässt mich die Vielheit der Schwingungen dieser Werke erleben und dadurch wird GOTT/das Göttliche präsent. Danke SWAMIJI, dass DU es uns auf solch vielfältige Arten ermöglichst, die Namen Gottes zu singen. Very beautiful MMS! 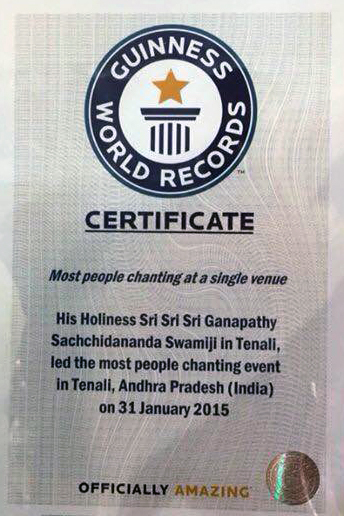 Shows the importance of chanting not only just listening. All Appaji’s bhajans have beejaksharas,…singing in satsangh is equivalent to chanting the divine stotras. Bless us Appaji! to not only listen more! but chant more!